The MiniRayTM Active Line Array speaker system is an excellent choice for musicians, AV presentations, and Houses of Worship to provide high quality performance audio. The MiniRay is well suited for mobile or permanent situations. Small to medium size venues will benefit from is small footprint, 24"x 17", and wide, smooth 100° horizontal dispersion. The MiniRay 652 sports a 300W class-D power amp driving two 6.5-inch woofers and a 1.5-inch compression driver. The MiniRay 12 is a 700W 12-inch subwoofer. The system easily sets up in minutes thanks to the integrated mounting hardware. The high frequency units can be mounted from 0-16.5° in 1.2° steps. Locking push pins ensure stability and quick adjustments. The MiniRay can be ground stacked with subs on the ground and tops mounted at the necessary angle on top to cover elevated seating. 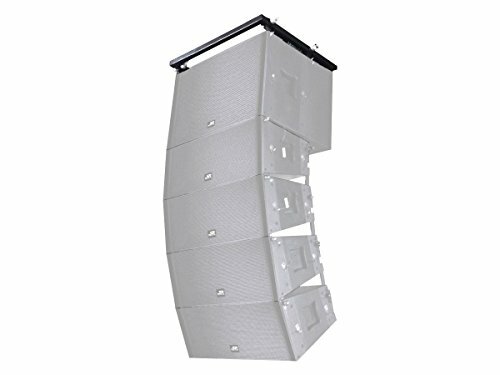 Using the MiniRay A1 Line Array Suspension Bracket your system may be flown with a maximum of 2 subs up top and up to 8 tops below, or 12 tops alone, without any subs. Sound is easily controlled with a 150Hz low-cut filter switch on the tops and a variable high-cut 40Hz-200Hz knob on the subwoofer. A properly deployed system is comprised of 652 tops and a 12 sub configured in a ratio of 4 to 1. This is optimal for most music presentation and House of Worship applications. Additional bass for high energy rock shows and electronic music can be achieved with more subwoofers ground stacked. The MiniRay is well suited for mobile or permanent situations. Small to medium size venues will benefit from is small footprint, 24"x 17", and wide, smooth 100° horizontal dispersion. The MiniRay 652 sports a 300W class-D power amp driving two 6.5-inch woofers and a 1.5-inch compression driver. The MiniRay 12 is a 700W 12-inch subwoofer. The system easily sets up in minutes thanks to the integrated mounting hardware. The MiniRay can be ground stacked with subs on the ground and tops mounted at the nessary angle on top to cover elevated seating. A properly deployed system is comprised of 652 tops and a 12 sub configured in a ratio of 4 to 1. Sound is easily controlled with a 150Hz low-cut filter switch on the tops and a variable high-cut 40Hz-200Hz knob on the subwoofer. This is optimal for most music presentation and House of Worship applications. Additional bass for high energy rock shows and electronic music can be achieved with more subwoofers ground stacked.